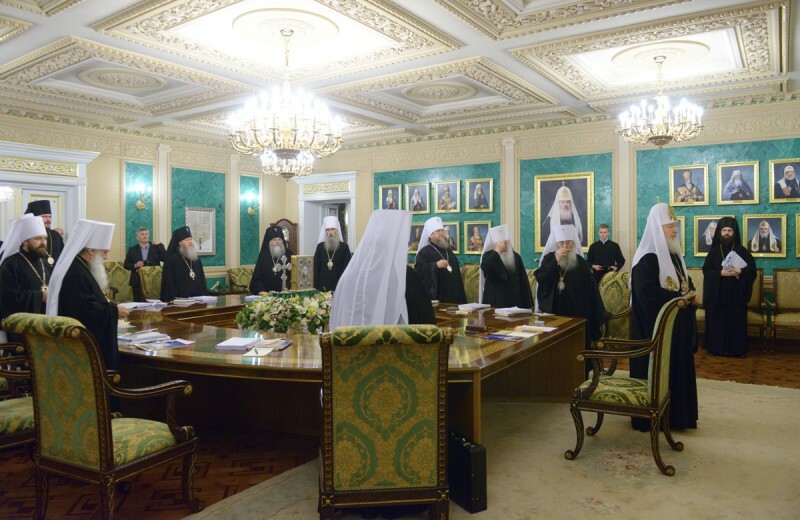 On 25 December 2013, the Holy Synod of the Russian Orthodox Church, chaired by His Holiness Patriarch Kirill of Moscow and All Russia, began its last session in 2013. The meeting took place at the Synodal Hall of the official Patriarchal and Synodal residence in St Daniel Monastery, Moscow. The permanent members of the Holy Synod are Metropolitan Vladimir of Kiev and All Ukraine; Metropolitan Vladimir of St. Petersburg and Ladoga; Metropolitan Filaret of Minsk and Slutsk, Patriarchal Exarch for all Belarus; Metropolitan Juvenaly of Krutitsy and Kolomna; Metropolitan Vladimir of Chisinau and All Moldova; Metropolitan Alexander of Astana and Kazakhstan, head of the metropolitan area of the Russian Orthodox Church in the Republic of Kazakhstan; Metropolitan Vikenty of Tashkent and Uzbekistan, head of the metropolitan area of Central Asia; Metropolitan Varsonofy of Saransk and Mordovia, chancellor of the Moscow Patriarchate; and Metropolitan Hilarion of Volokolamsk, chairman of the Department for External Church Relations. Summoned for the winter session (September-February) are Metropolitan Sergiy of Ternopil and Kremenets, Metropolitan Kirill of Stavropol and Nevinnomyssk, Archbishop Konstantin of Kurgan and Shadrinsk, Archbishop Iosif of Birobidzhan and Kuldur, and Bishop Nestor of Korsun. “I would like to note the importance of the document ‘Regulations for Military Clergy’. The document has been adopted by the Supreme Church Council and we should give our blessing for its implementation. “We will have to approve a number of important liturgical texts: orders of services and akathist hymns, prepared by our Liturgical Commission.